In addition to their cost saving benefits, installing eco-friendly roof gardens can literally bring historic buildings to life. They are known by many names – green roofs, vegetated roofs, eco-roofs, planted roofs, roof gardens – but perhaps the most appropriate is living roofs. All or part of a roof is covered with insulation, waterproofing, and a layer of specially engineered, light-weight growing medium. Colorful, drought-resistant plants are planted in the engineered soil. Before long, the roof becomes a lovely view for the upper stories of nearby buildings and, perhaps, an outdoor park for building occupants. 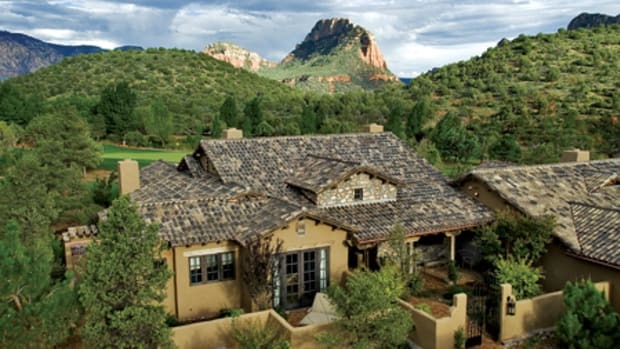 In addition to their aesthetic advantages, living roofs offer some very pragmatic benefits. In winter, they act as a blanket that prevents much of the usual heat loss from the building. In summer, the growing plants release water vapor into the air, creating an evaporative cooling effect for the roof. 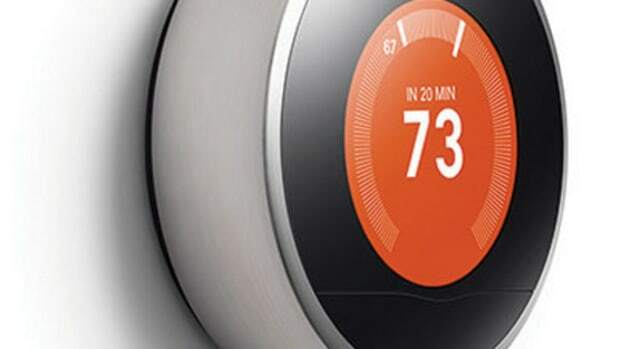 In both seasons, these effects reduce the amount of energy needed to heat or cool the building. On sunny days, the plants and growth medium shield the roof structure from damaging ultraviolet radiation, extending the lifetime of the roof. On rainy days, the engineered soil absorbs a large portion of the rainfall, eliminating or delaying runoff into municipal sewers. Throughout the year, the thermal stability of the soil layer reduces the stresses on the roof from the expansion and contraction that accompanies temperature fluctuations, further lengthening the roof’s life span. All of these benefits make vegetated roofs an appealing option. But are they appropriate, even acceptable, for historic buildings? Three recent examples prove they can be. The United States Postal Service’s seven-story Morgan Processing and Distribution Center in midtown Manhattan was built in 1933. In 2009, a living roof gave the building a new vitality. Because the roof is so large and strong, the architects were able to incorporate areas of extensive (shallow soil), intensive (deeper soil), and intermediate-depth plantings. Soil depths range from four inches for sedum plants to eight inches for four types of grass. A deeper planter box even supports a row of trees. Geography is one constraint, and the building’s structure is another. “The big question is the bearing capacity of the roof,” Kennedy says. The Morgan Building was an ideal candidate because its roof was built to become the floor of an added story if the building needed to be expanded. It can support as much as 200 pounds per square foot – more than enough for not only landscaping, but people loading as well. On work breaks, employees can relax on the roof and enjoy views of the New Jersey shore and the Manhattan skyline, including the Empire State Building. To allow for a potential extra floor, the building’s 176 internal support columns extended a short distance through the roof and were capped. 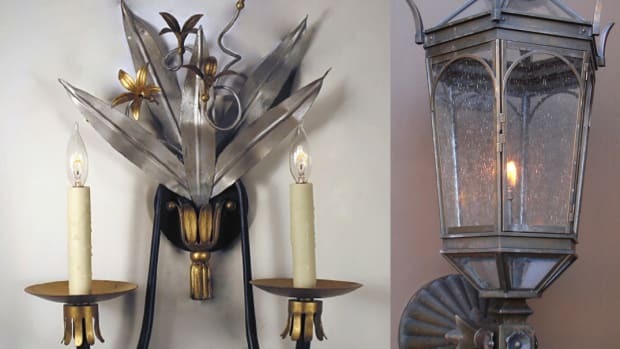 As original elements of the historic building, these features had to be preserved. 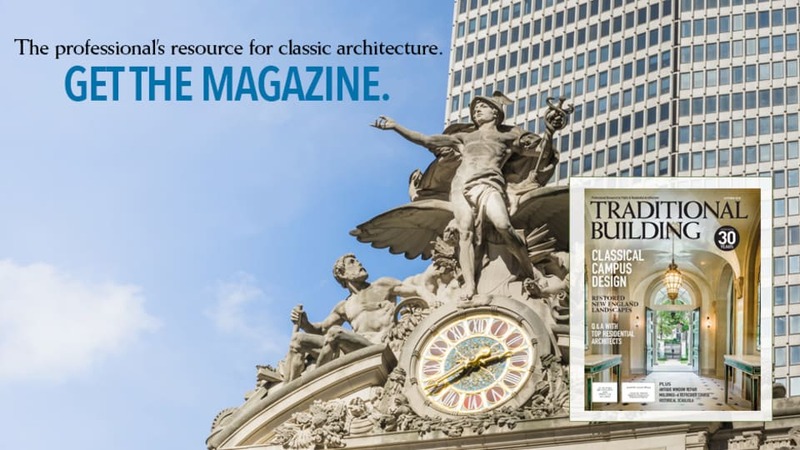 “The original copper column caps have been preserved in the design and woven into the layout,” says Shalini Mohan, AIA, LEED AP, the project manager for URS Corp. of New York and San Francisco, the firm that designed the roof. Instead, URS Corp. chose a bulk-applied system developed by Tecta America, Skokie, IL. An 80 mil-thick Sarnafil membrane and gypsum roof board were laid over several layers of extruded polystyrene insulation. After framing the areas to be planted at various depths, the roofing contractor, J.P. Patti Co., Saddle Brook, NJ, pumped over 900 cubic yards of Skyland USA’s, (Avondale, PA) Rooflite growing medium up to the roof, 95 feet above the street, and distributed it through a hose across distances as great as 300 feet. The roof’s plants and engineered soil are more than just a pretty face. They are expected to reduce the building’s annual heating and cooling costs by $30,000. They will also filter whatever rainwater they don’t retain, reducing pollution entering the New York sewer system by as much as 75 percent in the summer and 35 percent in the winter. Even without considering these extra benefits, the green roof is economically justifiable; although it cost twice as much as a conventional roof, it will last twice as long – up to 50 years. The Multnomah County Central Library was built in Portland, OR, in 1913. 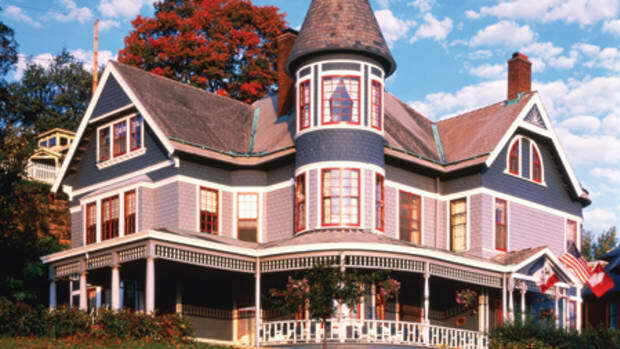 Nearly a century later, the building faced the challenge of a leaky roof. At the same time, the entire city faced the problem of an inadequate sewer system that flushed raw sewage into the Willamette River when overloaded with rain runoff. Innovative thinkers at the county’s facility management department saw the opportunity to address both problems at once by installing an eco-roof on the library. They expected the new roof to absorb 70 percent of the rainfall and to filter pollutants from what it could not absorb. As a bonus, they found that the solution would reduce the building’s energy consumption by 7 percent in the summer and 50 percent in the winter, while doubling – perhaps tripling – the roof’s lifetime over a conventional alternative. According to Carleton Hart Architecture, Portland, OR, designer of the new roof, they also wanted a system that would be lightweight enough to not require a seismic retrofit to the building, be efficient to install, and be easy to maintain. The 7,000-sq.ft. area to be planted on the roof made a modular system attractive. It was easy to put together a grid system that includes planted areas and walkways that provide maintenance access to equipment mounted on the roof. “If we needed to add a piece of equipment or an exhaust fan or needed to get to the roof, the palletized system will give us the ability to take out a portion of it if we needed to, easier than a traditional green roof,” says Multnomah County Facilities Property Manager Alan Proffitt. The county decided to use an Advanced Vegetative Roof System developed by Columbia Green Technologies, Portland, OR. The system consists of 2x2-ft. trays that interlock and also attach to the roof, making them resistant to winds. 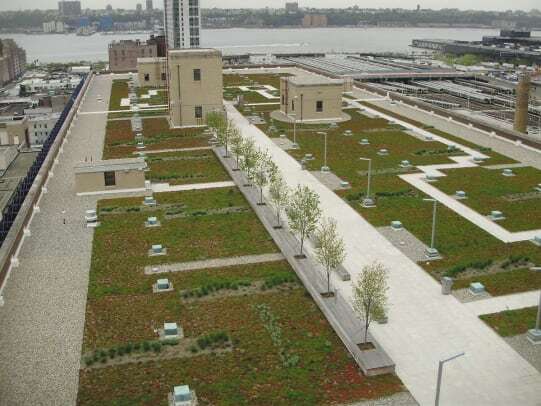 Installation consisted of placing the trays in the desired locations on the roof; filling them with four inches of a specially designed mixture of organic matter, inorganic matter, and a cornstarch water retentive additive; and planting a variety of sedums and drought-tolerant grasses. When saturated by rain or irrigation, the entire system weighs no more than 20 pounds per square foot. Constructed in 1956, this building in Kansas City, MO, housed the offices of Trans World Airlines, an important employer in the area. It was constructed using the lift-slab technique, where floor and roof slabs were poured at ground level, jacked up the support columns, and welded into place. A glass-walled penthouse suite sits on the corner of the L-shaped building, overlooking the third floor’s flat roof. The view was not pretty. The black membrane-covered roof often held ponds of rainwater until it evaporated or seeped into the building. “We thought we needed to do something to make that space an amenity to the building, and we started talking about roof gardens,” says David Dowell, AIA, of El Dorado Architects, Inc., Kansas City, MO. After investigating different planted roof systems, the designers chose American Hydrotech’s (Chicago, IL) Garden Roof Assembly. With only three inches of growing medium, the system weighs as little as 18 pounds per square foot, even when saturated with water. 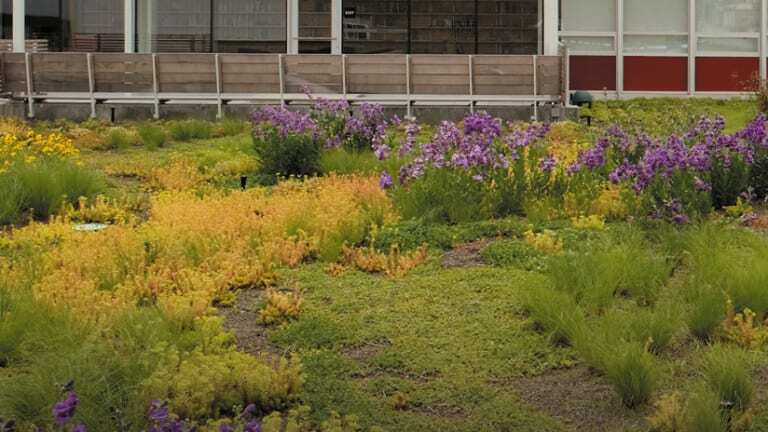 Since the new roof was completed in 2006, it has successfully supported 10 types of sedum, 30 types of wildflowers, and four varieties of native prairie grasses. “Little blue stem is the biggest grass; it’s probably four or five feet tall,” Dowell says. “There are birds, butterflies, ducks. We’re waiting to hear about deer somehow finding their way on the roof,” he adds with a chuckle. The original structure was strong enough to support the new gardens, but it had to be modified to support the load of people walking on the roof. “To accommodate the additional load of people gathering, the benches actually function as beams that help spread the load more efficiently,” Dowell says. Preserving the historic appearance of the building meant providing a buffer zone. The areas accessible to people are set back 10 feet from the edge of the building, so their presence on the roof is not visible from street level. A new department focusing on energy conservation in historic and new traditionally styled buildings. Small-duct systems with flexible tubing seem to be one answer to the search for energy-efficient HVAC systems suitable for historic buildings.